Sonic CD XBox 360 Review The simple plot for the game… yes these have plots… is that Amy Rose and Sonic head to Never Lake to find the legendary little planet which only shows up on the last month of every year. Oh the memories and adventures this brings back, this was one of Shael’s first game series when she was younger. Not counting the Sesame Street Learn to count games. Oh no, every ones favorite Impulse Gamer reviewer Shael Millheim at a very young age was zipping along across the screen in a blue blur. Gathering rings as she went and controlling the most famous blue hedgehog around….Sonic. Now Sega brings this classic and oh so fun game to Xbox Live Arcade. (CD, Sonikku za Hejjihoggu Shī Dī), Sonic CD beloved plat former took the gaming world by storm back in 1993. The game also marked the first time fans are introduced to Metal Sonic and Amy Rose. There is nothing really upgraded about the game that I can tell, it still looks like it did back then. Pixels and polygons, like a computer’s psychedelic yawn. But it still has that original side scrolling mad dash plat forming charm it always has. Other gamers have noted that the controls and handling of Sonic are much smoother now so, there you go. 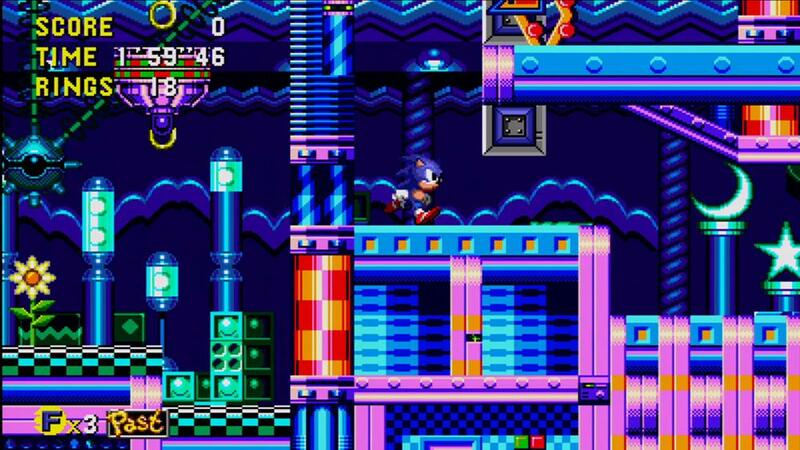 Players control Sonic, our blue Hedgehog Hero as he super speeds through each level. Running fast is not the only thing that will get you to the end of the level though. Sonic has to make use of jumping spins and spin attacks. 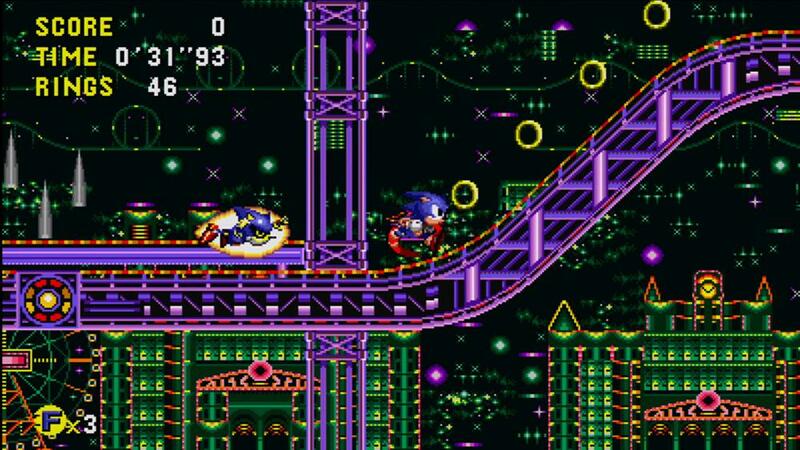 All along the way Sonic collects rings which in turn offer some protection if Sonic bashes into a nasty obstacle or an enemy. Sonic loses several rings each time, but can collect more as the game levels progress. 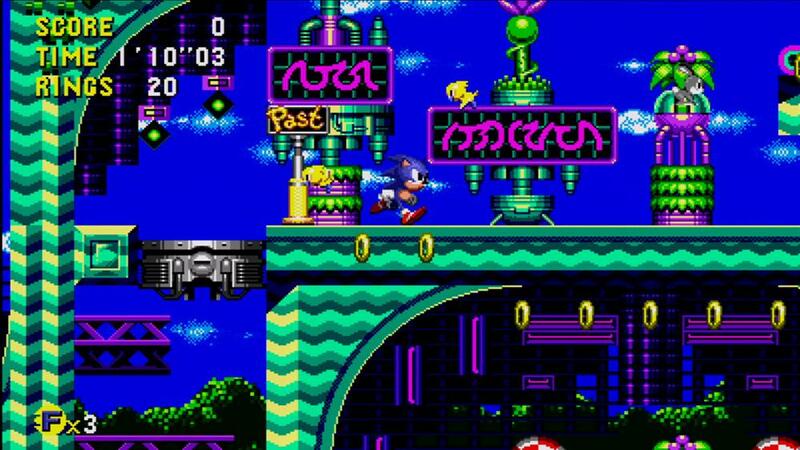 Along the way Sonic finds power-ups by way of signs or picture boxes that have to be bashed to release the prize. These power ups offer things like invincibility and super speed shoes….like this Blue Streak needs to go any faster heh. Of course along with the enemy underlings the big boss Dr. Eggman stands against the Blue Hero. Boss battles are a small challenge and Dr. Eggman throws his creations Sonic’s way in an attempt to finish of the Hedgehog. This game also introduced a nifty game play feature, time travel. Within each level players who have the skill with Sonic can in fact jump to different time periods within a level. Hitting a sign post that says future or past and then running at a fast speed can rocket the player into future, past or back to present times of each level. Time jumping offers new more difficult challenges as jumping to the future for instance seems to have many more enemies and obstacles for our hero. Players also get the chance to unlock Tails who is also a playable character. Much like Sonic, Tails can use Spin Attack, Spin Dash, but as many fans know, Tails can also fly by spinning his multiple tails around. The simple plot for the game… yes these have plots… is that Amy Rose and Sonic head to Never Lake to find the legendary little planet which only shows up on the last month of every year. Getting there, they find the planet seems to have been captures and is chained to a mountain. Of course Dr. Eggman has something to do with it. Sonic Cd may not look pretty, game wise though it is a solid fun romp in the retro gaming realm.